How freakin’ cute can you be? 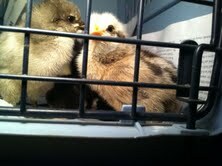 Oh my, I’m very happy that these chicks will uglify before I have to off some of them! geez these guys (or hopefully gals) are cute! 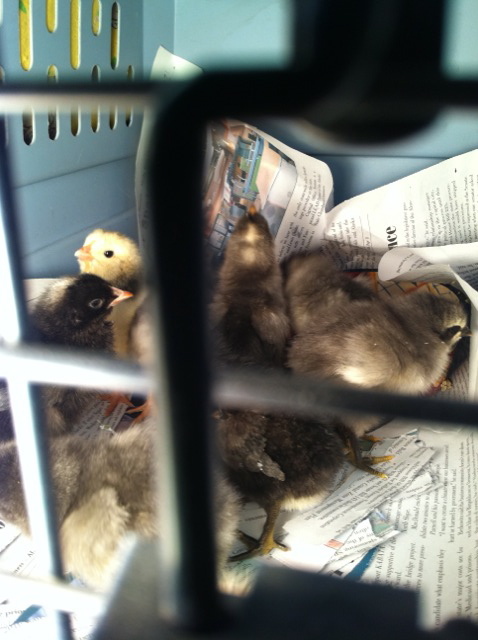 I got 10 unsexed (straight run) barnyard laying mix chicks from my local Chickaloon goat milk and egg supplier. I’m hoping for a roughly even split, since I want about 5 laying hens. I can’t keep roosters in town, plus I eat local meat, so I’ll be figuring out roo butchering later this summer/fall. Right now they are in a cat carrier with a 100 watt bulb, shredded newspaper over a sheet of newspaper on the bottom, with small ceramic dishes of food and water (I refuse to buy new specialized chick rearing equipment.) The food bowl is doing well – it is small and kinda high, so the chicks hop in to eat, but the food stays in the bowl when they scratch, and it is small enough that most of the poop lands outside (their butts hang over when they eat). They seem to be doing quite well, 24 hours later. Mostly they are grayish and fluffy. A couple have some yellow and dark brown, one seems a bit banty-ish with fluff on the legs and on the small side, a couple are black and barred rock looking. I get some blue eggs from the farm, so hopefully a couple have the blue egg laying gene (just for fun). Now I gotta build the hen run and section off their home in the back shed! I planted some siberian pea-bush in the run-to-be since the seeds are good chicken food. In other news, the bees seem fine, the garden is coming along (though I still have a lot of seeds to plant), and my summer bike got stolen again. And there still is not enough time in the day to do it all! !